Choosing a care facility for your Loved Ones' "Home Away From Home" is a difficult decision. Luther Manor’s goal is to fulfill not only each resident’s physical, mental, and emotional needs, but social and spiritual as well. In 1967 Reverend Ralph A. Plautz, Pastor of St. John’s Lutheran Church in Hannibal MO was dismayed at the conditions that existed in nursing homes serving many of the people in his congregation. From his efforts, and a committee from St. John’s, the idea expanded to six other Lutheran congregations in northeast Missouri. Interested persons from these congregations formed a non-profit organization and Luther Manor Association became a reality. In Early 1969 the Luther Manor Association purchased a tract of land from St. John’s Lutheran Church of Hannibal. Board Members were appointed to represent the six congregations. The facility was opened on June 1, 1972. We continue Reverend Plautz and the original founders' vision of "Caring and Sharing" today with the highest quality care in the most home-like environment possible. 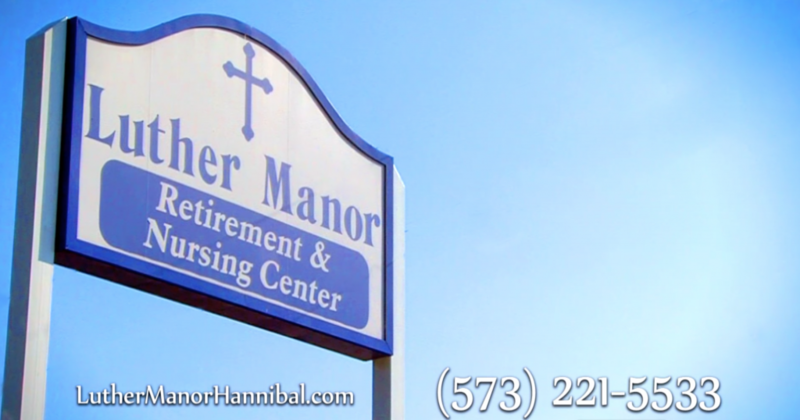 Luther Manor is located off of Highway 61 North in Hannibal Missouri in a comfortable, park-like, country setting. We provide a family atmosphere and care for your loved one with dignity, respect, and compassion. Please call to schedule a tour to see for yourself! Our doors are open to all regardless of religious affiliation. Are you interested in a career with us? Apply in person in the business office at Luther Manor.